Jacqueline graduated from U of M Dearborn in December 2010 with a Bachelors in Biology and Psychology. 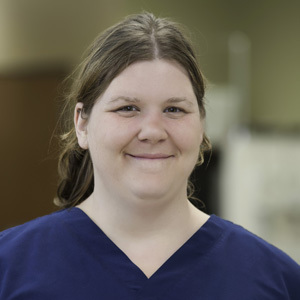 In May 2013 she graduated from Wayne County Community College with an Associates in Applied Science for Veterinary Technology, and she has been a Licensed Veterinary Technician since October 2013. Jacqueline has been in the Veterinary field since December 2009. She started off as an assistant and later a receptionist and then began doing technician duties while continuing school. During summer 2013 she did an internship at the Detroit Zoo and was able to work with many different exotic animals. She performed lab work and assisted in surgeries on many different species. She also interned at Canton Center Animal Hospital where they see many exotics on a daily basis. Jacqueline has always wanted to help animals. Ever since she was a little girl she has owned many different pets ranging from dogs to hamsters to lizards. She has always been a caregiver and as a veterinary techician feels that her job gives her the opportunity to care for those who cannot care for themselves. "I've always stood by the saying Be the voice for those who have none. Animals cannot tell us how they feel, so it is up to us to make them feel better. I am so amazed at how far veterinary medicine has evolved, and I feel so good at the end of the day when a patient has recovered well. It gives me great pride to call myself a Veterinary Technician. I feel like I have unlimited amounts of compassion and love to give to the clients, patients and AEC." Jacqueline's hobbies include Geocaching, cooking, hiking, reading, hanging out with friends and playing roller derby! She is on a league called The Downriver Roller Dollz. Jacqueline also loves spending time with her two kitties Hank and Zelda, and her two basset hounds Ray and Zazie! Jacqueline is constantly becoming more educated about exotic animals and emergency veterinary medicine, and would like to earn an LVT specialty certification.